I agree to Solidworks Agreement Terms shown below. NEW for SOLIDWORKS STUDENT EDITION 2018-2019! Product now includes SOLIDWORKS CAM Professional -- a fully integrated, knowledge-based CAM system. Students now have access to MySolidWorks Professional for online training resources and certification preparation. Product includes CSWA and CSWP exam vouchers, so students can boost their resumes and jumpstart their careers. System Requirements: Windows 7, 8.1 and 10. Optional Installation/Back-up DVD is available. This option will be presented to you when you add Solidworks to your cart. A student license for the Software expires after 12 months (subscription starts upon software activation), does not include Subscription Service, and is not upgradeable. The software uses a soft-lock mechanism to limit installation to one computer only. For personal/educational use only. Please read and agree this application (check box above) along with verification of your Student/Faculty status, i.e., a copy of a current identification card from your educational institution, a confirmed course schedule, or registration confirmation or enrollment confirmation from the registrar's office. DS SolidWorks Corporation requires that users of the Student Edition are enrolled in a minimum of six (6) credit hours in a degree-seeking program at an accredited educational institution or are full-time faculty members of an accredited educational institution. 1. I certify that I am a degree-seeking student or a full-time faculty member at the accredited educational institution written below. 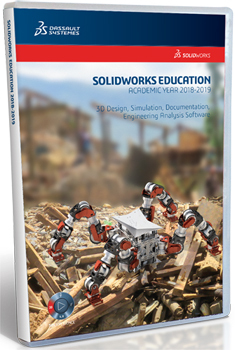 I am purchasing the DS SolidWorks Student Edition for my own personal academic use and will not use it for commercial or professional purposes. Degree-seeking student: I am a registered degree-seeking student at an accredited educational institution. I am accepted into a degree-granting program and can confirm current enrollment in six (6) credit hours. As proof of my student status, I have attached a copy of my current dated student ID and a copy of a dated document that confirms I am currently registered for at least six (6) credit hours. Faculty: I am a full-time faculty member at an accredited educational institution. I have attached a copy of my faculty ID or proof of employment. 2. I agree that once I have accessed the DS SolidWorks Student Edition, I will agree to and be bound by the terms and conditions of the accompanying DS SolidWorks Student Edition License Agreement. I understand that I may not sell, transfer, modify, or copy the DS SolidWorks Student Edition. I agree that the software license I have purchased is for personal academic purposes only. I understand that commercial or professional use of either product will immediately terminate my right to use the software. 3. I understand that the DS SolidWorks Student Edition License is for a specified term and may not be upgraded to future versions. Any future purchases of the DS SolidWorks Student Edition will be subject to similar terms and condition of use, and will require a separate Purchase Application and qualification process. 4. I understand that the Software contains (i) a soft-lock that permits it to be loaded on only one computer and (ii) on-screen and printing features that identify the software and the related files as a "Student Edition," making it unsuitable for use in a professional environment. 5. I understand that no technical support is available for the products. A Web site for registration and installation support is available at www.solidworks.com/student support. I have read and agree to the above Terms and Conditions for Purchase of the DS SolidWorks Student Edition. A Parent or a legal guardian must sign for their dependent High School Student. By agreeing and submitting, the parent or legal guardian agrees that his or her dependent will be bound to the terms and conditions of purchase and the terms and conditions of the DS SolidWorks Corporation Student Edition License agreement. Add the training you'll need to get the most out of SolidWorks!